Make Signs for Office, Retail, Business, Residential, etc. 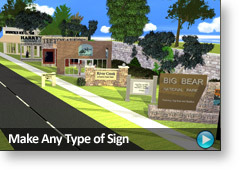 "My partners and I discovered how easy it is to use plan3D for leasehold improvement mockups - even with signs. I was skeptical about your product at first, especially because of the price - but I'm a true believer now! Showing potential renters how a build out might look sometimes get us a verbal lease agreement day one. Thanks guys." "My wife and I recently retired and thought it'd be fun to open a little cafe, book store, movie rental shop to keep us busy. There's been a lot of vacancies around here lately so we lucked out and found a great location and low rent. We've used plan3D in the past for our house and decided to lay out the store interior and try our hand at the storefront and sign too. We've only been open a couple months but we're already breaking even! You ought to tell people that plan3D is good for more than home designing stuff. You're really missing out." Plan3D was designed to be easy for busy people who don't have a lot of time to learn complex software. When you learn one thing in plan3D - such as designing a kitchen, or landscaping a yard, or putting in a sign - the same skills are used. You don't have to learn all over again. Not only can you create 3D lettering of any font, size, and style, you can apply your own logos and other graphics to any surface. Plan3D makes it easy. Do vinyl signs, 3D lettering signs, graphic signs, logo signs, sales signs and anything else you can imagine. Use plan3D to create your entire retail store, restaurant, church, or other structure inside and out - so you can easily visualize your sign ideas. 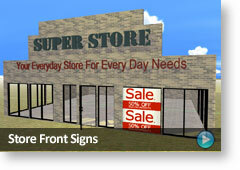 See how the sign will actually look on your building - before you hire a sign company. Tell them what you want - don't let them tell you. 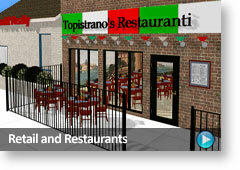 Plan3D also lets you lay out your restaurant, office, or retail store on the inside and outside - and landscape it too. So it's not just signs - it's everything. Any laptop or desktop with Windows 8, 7, Vista, or XP.